The Los Angeles subway system broke ground on the Westside Subway extension! Photo by Chris Yarzab. Construction on the much anticipated, $6.3 billion Metro Westside Subway Extension Project in Los Angeles has finally broken ground. 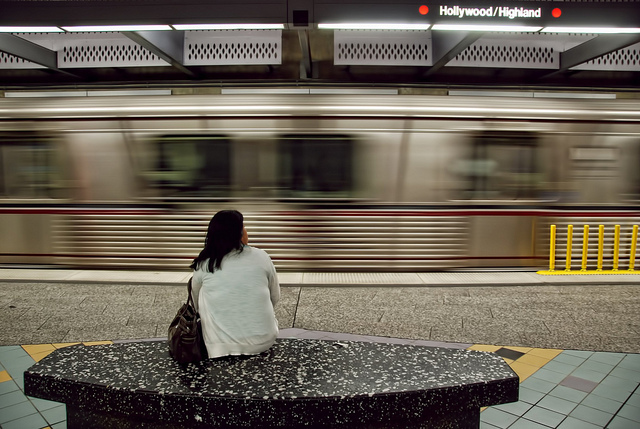 The 72 station rail system’s first new stop along the extension at Wilshire Boulevard and La Brea Avenue will be open by 2023, along with two more stations extending to the edge of Beverly Hills. An infrastructure fund has been created from general revenues of Bangkok’s Skytrain operator, BTS, to fund the expansion of four more mass transit lines. The $1.6 billion dollar fund, though designed to finance capital expansion costs, will still generate funds for existing Skytrain projects. The University of Malta is hosting a sustainable mobility conference on November 30th, bringing international leaders to the tiny Mediterranean island state. Malta, which sits midway between Tunisia and Sicily, has become a global shipping and cruise-tourism hub and suffers from seaside and landside emissions from these industries. Montgomery County, Maryland, which sits immediately adjacent to Washington, D.C., is struggling to produce a viable funding scheme for the suburban regions’s proposed BRT system. County Executive Ike Leggett indicated that existing funding for the proposed 23 route system would not even cover construction costs for 10 routes. Leggett is open to increasing local taxes to create a smaller system. The Government Audit Commission of Hong Kong, the internal ombudsman of the autonomous region, has found that government targets for air pollution reduction have consistently failed since 1987. Air pollutants exceeded the standards set by local authorities by up to 53-percent, with nitrogen dioxide levels exceeding World Health Organization set limits by 205-percent. The Guardian Newspaper co-hosted a webinar with Ford Motors, Solving Global Gridlock, with a Q&A format sourced from tweets. The questions, posited in 140 characters or less, ranged from transportation demand management inquiries to classroom “gameification” efforts to create sustainability awareness for the next generation. Chicago has debuted a new type of bus service that preëmpts the long awaited BRT system that has yet to hit the streets of Chicago. The Jump service, essentially an express service bus, does not demonstrate all the qualities necessary to be considered BRT, yet features some dedicated right of way (lanes) during directional rush hours with differentiated signage-marketing. The Chief Minister of Punjab Province, Pakistan has given an ultimatum to BRT contractors in Lahore, stipulating that no flexibility will be given in project completion times for what he describes as a “unique project of public welfare.” The Minister demanded acceleration of the project, yet no specific ramifications for breaching construction timeline agreements were issued. U.S. Secretary of Transportation Ray LaHood will be taking questions as a part of his monthly public Q+A series in coordination with Atlantic Cities. Atlantic Cities editors will be allotted several questions, taken directly from readers of the blog, in what may be one of Secretary LaHoods last sessions in office. The Asian Development Bank has awarded $300 million in grants to develop the urban transport network of Baku, Azerbaijan. The grants will chiefly be purposed to upgrade nearly 2,800 kms of road in accordance with E.U. standards by 2015. The grant will both target underpaved roads and low amenity rights of way, inlcluding upgrades to road crossings, metro services and public transport network extensions. Cyclists in suburban Atlanta staged a period-dress bike ride, akin to a well dressed Critical Mass, in the effort to build cycling as an everyday activity not reserved simply for spandex and competitive athletes. Decatur, Georgia, the host of the event is one the newest members of the League of American Bicyclists’ bike friendly cities, and sports bike lanes and shops to accomodate the more practical aspects of everyday bicycle mobility.